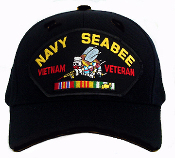 Show your Seabee pride with a Patch Cap! The top quality caps are made by Eagle Crest, supplier of official military headware. All caps are black and come with your choice of embroidered front patch featuring a colorful embroidered FIGHTING BEE. Choose from these embroidered patches: SEABEES CAN DO, NAVY SEABEE VIETNAM VETERAN, or US NAVY RETIRED.